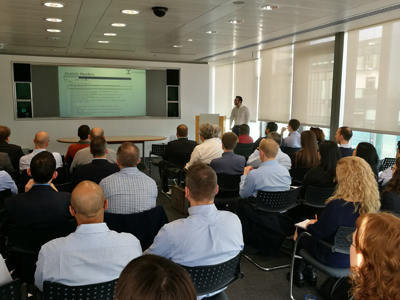 On Friday 18th November we were in attendance at the biannual ACL User group which was once again kindly hosted by Grant Thornton. The popularity of these groups is growing each time and a record number of 49 keen ACL users and representatives were in attendance to network with industry peers, share knowledge and opportunities and listen to three excellent presentations. Greg Olenski of DataConsulting got the ball rolling with an in depth look at some of the technical steps required when putting together a Continuous Monitoring process and how this fits together on the analytics maturity curve. This was followed up by Nick Hill of Royal Mail, fresh from delivering his presentation at the Chartered Institute of Internal Auditors Annual Conference, on some of his experiences using Smart Techniques for Audit Testing and Sampling. Finally Nils Erlemann from ACL showcased some of the new features in ACL v12 and for anyone that is interested in seeing this you can also view the webinar presented by Dan Zitting and Keith Cerny at the bottom of this post. Feedback on the day was extremely positive, with a good mix of technical and higher level presentations. We hope to see you at the next user event and in the meantime, if you have seen anything you might want to find out more about then please get in touch.